Birth is truly amazing, Hypnobabies helped me experience it in comfort and without any fear. On Monday the 15th I started feeling contractions that were definitely stronger then braxton hicks but they came with about the same frequency as I’d been having braxton hicks so I didn’t think much other than my body was getting ready to have the baby, but it still could be anytime. I’d also been feeling sharp pains in my cervix for a while but wasn’t sure if it was just baby poking me with her little hands, or if it was my cervix dilating as some thought those pains were. On Monday I also felt more mucus when I wiped after going to the bathroom, but it was just clear or whitish so I didn’t think it was my mucus plug. On Monday night when my husband, Mike, and I were in bed, I had an emotional breakdown and accused him of not remembering what it was like to have a newborn. He’d made some comments about things we could do after the baby arrived that I thought were ridiculous. I got everything out that I’d been thinking and voiced some of my concerns about having a new baby. At first it turned into kind of a heated argument and I cried a lot and Mike was mad but then we had a good discussion and both of us went to bed happy. Sometime in the middle of my crying I had the thought that maybe this was an emotional release I needed to do to be ready for baby and for the first time thought that maybe the signs were pointing to it happening pretty soon- maybe even the next day. I didn’t say that to Mike, though. I woke up the next day, Tuesday the 16th (3 days before my guess date) and felt the same as I had the day before. I had sporadic pressure waves that were like strong Braxton hicks but I hardly gave them a thought. I dropped my daughter off at preschool at 9, stopped at a favorite coffee shop and got tea and coffee cake and then headed home to start on some projects that I had planned for the morning. By the time I got home around 10, I realized that I probably wasn’t going to get anything done because I was having pressure waves that were still really sporadic but I felt best just relaxing on the couch. After I got home I went to the bathroom and when I wiped I had a bunch of tan, bloody mucus. Definitely my mucus plug. I called Mike at work to let him know what was up but at that point I didn’t know if this was going anywhere so he should stay at work and not be too excited. I texted our doula to tell her the same. After all, some women deal with this off and on for days before their birthing time really starts, right? Not too much later I talked to Mike again to let him know that I didn’t feel like I should drive to pick up our daughter from preschool because I didn’t want to have one of these pressure waves while I was driving. He said he’d pick her up at 11:30 and then come home and work from home for the rest of the day. In the meantime, I piled up pillows on the couch and leaned forward against them. Just in the last couple of weeks my baby had been sometimes turning a little posterior so I wanted to give her every encouragement to be in a good birthing position. I put on the easy 1st stage track and listened to it out loud. I was really comfortable and my pressure waves weren’t too frequent. Mike and Sairshe got home a little after 12 and I turned the track off so I could interact with them. Mike puttered around getting his workspace set up and checked his work email. Then he started making lunch for the kiddo. I asked him to scramble a couple eggs for me since all I’d eaten was coconut coffee cake and I had the foresight to think that if this was really the beginning of my birthing time, I should eat something a little better. I didn’t really time my pressure waves at that point but when I did think to look at the clock they seemed to be really irregular- 10 minutes, then 5, then closer to 15 minutes. Around noon my midwife’s office called to sat that Catherine, my midwife, had been called to a birth and needed to reschedule my appointment (I’d had one scheduled for that afternoon) and since I wasn’t ready to say for sure my birthing time had started, I didn’t mention it and just rescheduled my appointment for later in the week. Mike thought that I should have said something. At some point my daughter started to bother me and I regretted turning off the easy 1st stage track so I told Mike he was on his own with her and moved to my bedroom. I tried to recreate my comfy couch spot by piling pillows up against my headboard and leaning onto them and I turned on the easy 1st stage track again. I couldn’t really get as comfortable as I’d been before everyone got home, though, and I was a little frustrated. My pressure waves seemed to be coming with a little more regularity and were getting stronger so I told Mike he should probably call the midwife and give her a head’s up. I heard him talking on the phone and then he came into the room I guess to ask me something but then he said he’d call her back in 5 or 10 minutes. Catherine told me later that Mike hadn’t been sure if I was having a pressure wave or if I was just resting but either way, he hadn’t wanted to disturb me right then. I had been having a pressure wave but was still able to appear pretty relaxed. When Mike came in again and saw that I’d opened my eyes, he asked if I wanted Catherine to come and check me and I said something along the lines of “I guess so.” He called her back and asked her to come and I also heard him call our doula and tell her to come over too. This was maybe 1:30 and my pressure waves seemed to be suddenly coming more regularly- 4 or 5 minutes apart- though they still seemed pretty short and were really manageable. Somewhere around this time I asked Mike to call my mom and tell her that baby was on her way. My mom lives out of state but had asked us to let her know. Our daughter was in the dining room eating lunch and Mike started inflating the birth pool in the living room while I stayed in the bedroom. As soon as that was all set in motion, I had several really intense pressure waves. I definitely couldn’t be still through them so I’d quickly put my lightswitch in center and sway my torso back and forth while I knelt on the bed. In the easy 1st stage track Kerry reminds us several times that “you are safe and your baby is safe no matter how much power goes through your body” and that was my mantra during those intense pressure waves. It was SO much power! I felt like in my head I was yelling that mantra to myself and I didn’t feel particularly calm in my head but my physical body stayed as relaxed as I could make it. Even though I was still sitting/kneeling on the bed my legs started feeling kind of shaky during these intense pressure waves. I had the fleeting thought that it felt kind of like transition but then dismissed it because my pressure waves had only recently become regular and still weren’t terribly long or close together. I then started to doubt if I could keep up this calmness and looseness through out my birthing time if this was how intense it was going to be. I decided I needed a change of scenery and felt like I should go to the bathroom so I sat on the toilet. My next pressure wave definitely felt pushy. I yelled for Mike and had to yell a couple of times and pretty loud since he still had the air pump running to blow up the tub. At that point I realized I wouldn’t have time to use the tub but water felt like it would be amazing. I thought of filling up the bathtub since that would be quick but then decided even that wasn’t really worth it. Catherine helped me move to the bedroom and I brought my phone that was still playing the easy 1st stage track. I got on my knees on the bed but felt like being in a more upright position so I asked for something to lean against. I still had the big pile of pillows on the bed so Mike moved that closer to me and I got in the same position I’d been in before- up on my knees but leaning forward onto pillows. Immediately I was pushing. I asked Catherine a couple of times if it was really ok to be pushing because I still was having a hard time believing that I was at that point already. She assured me that it was fine and my baby was ready to be born. With each pressure wave I vocalized a low (but loud) “aaahhhh” noise and let my body do the pushing. I didn’t have to think about it, it’s just what felt right to do. It was amazing to be able to really feel her moving down. With my 1st, I pushed for 40 minutes and never really felt that movement with my pushing. It was really great to feel that my pushing was doing something and it wasn’t painful at all. I said once that I felt stretchy and that’s really all I felt. My only discomfort was that my legs got tired being in that position. I was really thirsty and Mike gave me sips of tea in between waves and he put his hand on my shoulder and reminded me to relax and told me how great I was doing. After a few good pushing waves, my water broke and I really felt the pressure of baby’s head. I think it was the next pushing wave that she was born. She seemed to just fly out of me and I immediately felt an emptiness in me. It was a weird sensation and I think it was because I hadn’t really been prepared for her birth to be so quick. I had just felt like I was really in my birthing time and then she was born! It was so amazing to hold that brand new baby. Seconds after she was born, the room got really quiet for a second and at that moment we could hear my hypnobabies track that was still playing quietly just as Kerry was saying “. . . your beautiful birth.” Catherine said “That was beautiful indeed.” I turned around and saw that as I was pushing the 2nd midwife, a nurse and our doula had all arrived just in time to see the birth. Mike was holding Sairshe who got to see the whole thing too. She got a little nervous after the baby arrived so she went back out to the living room and played with our doula while I birthed the placenta and nursed my new baby. A little later she came in and we all snuggled up in bed together, which was awesome because that had been my special place that I’d practiced imagining for so many weeks. Carys was born on November 16th at 2:34 pm, only about 20 minutes after Catherine arrived and just over 4 hours since I’d had the first thought that just maybe my birthing time was starting, but I wasn’t at all sure. I sure am glad we had a homebirth planned because I’m pretty sure we would have had one regardless! Hypnobabies worked great, even though I didn’t have a lot of time to use my tools this time! There were maybe 2 or 3 pressure waves that were pretty darn uncomfortable but the rest of the time I was really comfortable, even when I was anxious and not sure if a midwife was going to arrive in time. I listened to the tracks mostly as I was going to bed each night so I slept through them and just as everyone says, that really does work. Birth is truly amazing and Hypnobabies helped me experience it in comfort and without any fear. Mamas, you can do this too! This was my first hypnobaby. My first two were natural-one in bed, the second a water birth. Water broke with the first two as the start of labor and then 5-6hr labors which came on fast and strong. I had been having lots of braxton hicks my whole pregnancy and for the week prior to labor I had some significant contractions during the night, sometimes regular. I practiced my Hypnobabies finger drop technique and was amazed that it actually worked! I would even giggle as I gave myself the “peace” cue and I actually felt good. I had also been charting my temps to see if there would be any correlation with labor. I had been running in the mid 97’s and Thurs morning it was low 98’s….not a huge jump, but enough to make me wonder…. I got up at 6am and went potty and had a lot of mucus…no blood tinge…and had been losing pieces for a couple weeks, but this was the most. Had a contraction, not unusual. Nursed my 1 1/2yr old and had about a 10 minute very significant contraction…also, not something that hadn’t happened before. 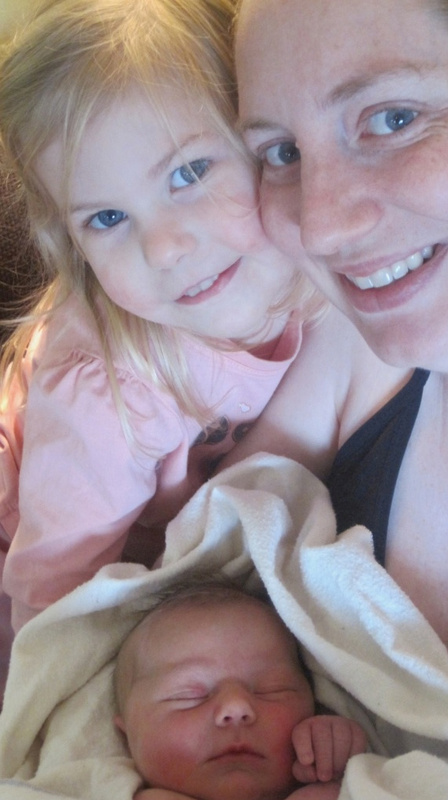 Then I started having contractions but they were very mild….was busy getting my girls ready and myself for work even though I thought this might be it. Was a little shaky so we all had breakfast, my contractions were 2-4min apart but not strong. I wondered if I should make my calls, my mom who had to come up for the girls was over 1hr away and my husband was at work 45 min away, I was 30 min away from the hospital and with my last I arrived and started pushing…so I didn’t want to cut things too close. At 7:30am I decided to head for the hospital. Contractions spaced way out in the car and I thought I was a fool for not sitting down at home to see if they went away…but I had already made my calls so I headed in anyway. They were so mild I was just chatting away happily and having a tea party with my girls. The midwife came and asked if I’d like to be checked…I told her yes because I think it might be a false alarm…I was apologizing when she told me I was 8cm and 100% effaced. I was shocked–I still felt fine. Probably sometime around 9am I felt a very different pushy contraction….we called for the nurse and the midwife and I started gently easing out my baby. The pressure was very intense at this point. Fortunately my midwife teaches hypnobirthing (I was unable to take the class due to child care issues–which is why I discovered Hypnobabies). She was saying all the things I was familiar with in her soothing calm voice. I stayed very calm and relaxed and our little girl made her way into the world at 9:18am on 9/18. She is beautiful and perfect and I LOVED my birth. No tears, no hemorrhoids and I feel great! Just reminding everyone that we have a toll-free Testimonial line for our students and birth professionals to call and leave a brief message which will be posted on our new website soon. These audio files will allow more expectant parents to hear directly from families how Hypnobabies can help them create a much easier more comfortable and joyous birthing. Davis Arrives on his Mom’s birthday! Davis was born on my birthday, September 27th at 6:34pm. Weighing 7 pounds 10 ounces and 21 inches. (The exact same measurements as our first born). Not sure exactly when to say my birthing time began. I wasn’t feeling the greatest on Friday, so I told my mom and DH that I had a feeling the baby was going to be coming the next day. So I went to bed early that night hoping to get some extra rest just in case. Thank god I did, I’m so thankful I got those extra hours of sleep before everything began. DS#1 crawled into our bed about 6:45am on Saturday morning. I noticed I was having some mild cramping in my tummy and back every 4 minutes. So after lying there for 30 minutes, I decided to get up, and felt much more comfortable. I went to the bathroom and noticed some spotting, so I knew that this was probably going to be the day. I went about the morning as usual. Made breakfast and got things packed for the hospital and for DS#1. I called my mom at 9am to come and get DS, even though I was feeling fine, I figured it would be nice not to have any distractions. I tried sitting down all morning, but had so much pressure in my bottom and back, that I could just not do it. So I stood or walked around the house most of the morning. The pressure waves were fairly consistent but extremely manageable. Around 11:30am, I was getting disappointed things weren’t picking up, so DH and I went for a walk to see if that would get things moving. We walked for 30 minutes, and I only had one mild pressure wave the whole time. I was completely confused if this was actually my birthing time. I actually remember contemplating if DH & I should go out for Mexican for lunch for my birthday, since I was feeling fine and thought it was false labor. But decided Mexican might not be a good idea if this was really my birthing time and decided to take a nap instead. I put my headphones on and laid down from noon until 1:30, I had mild pressure waves during this time, but for the most part was able to sleep. I got up at 1:30pm and called my mom and told her maybe this wasn’t the time and said maybe I would still go to this wedding with her at 3pm, that we had planned on going to. I told her to call back in an hour and see if I’d be ready to go. Well we didn’t go. Shortly after the phone call things picked up, and I was have consistent pressure waves that started to pick up in intensity. DH was great during this time, we listened to soft music, my CDs, he read scripts, and described my special place. I sat on my ball, the toilet, relaxed in the shower. By about 4:30pm, I got out of the shower and felt as if I still had a long way to go, since I still felt great and was handling everything well. After about 15 minutes, I started to feel nauseous and dizzy and thought maybe we should go to the hospital just in case, even though I didn’t want to go since I figured I wasn’t far enough along. The whole way to the hospital I visualized myself being at least at 6, but hoping I was at 8. We arrived at the hospital at 5pm. Right before we walked into the hospital I almost had a moment of panic and started crying as I knew what I had ahead of me. I took a deep breath and said “Bubble of Peace” and all my anxiety lifted. The nurses I had were great and so supportive of a natural birth, unlike my first birthing time. They knew I didn’t want to wear the fetal monitor and put it on for 10 minutes and then just monitored me with the portable doppler. When the nurse checked me I was a 7. Yay! Right in between where I had hoped. The nurse told me they could break my water but recommended they didn’t so that the pressure waves didn’t get too intense. I got into the tub, upon her recommendation and loved it! The pressure waves started getting more intense and I remember saying to myself “Pressure, Tightening, A Big Hug” every time I had a pressure wave, it helped me remember exactly what I was feeling. When DH would use his relax cue, my body would just melt and instantly relax. Not sure of the time, but about an hour later I told DH I did not want to sit in the tub anymore. I came out of the bathroom and the nurses were setting up the room for delivery. I wasn’t sure why since no one had checked me, and I still figured I had a long way to go. But apparently I had become more vocal, mostly making a low humming sound and they could just tell. I had 2 or 3 pressure waves which must have been transition because that was the only time I had felt somewhat out of control. Mostly just the last pressure wave, I think because the doctor wanted to check me while I was having one. I did not want him to do that, and remember being very vocal that he did, but I think he was holding back the last little bit of cervix so I could start pushing. With the beginning of my first push my water broke. an epidural last time I had to push, so this was a whole new experience for me. My CD was playing and DH was saying relax but I don’t think I listened to anyone. I tried to gain some composure after the first push and did a little better on the second one, but I was so eager to get this baby out I pushed too hard and fast and ended up tearing up. Baby came out on the third push. What a relief! Recovery this time has been amazing. I still can’t believe I did this and that Hypnobabies worked, I was a little skeptical, but glad I stuck with it. My only regret was not staying relaxed during the pushing phase. But all and all I am so pleased how it went. My DH was an amazing birth partner. I never wanted him away from me especially if I was having a pressure wave. It was as if I couldn’t get through it without him. He made me feel so calm.